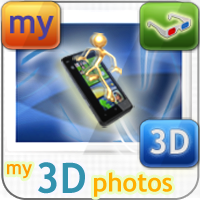 The My3DPhotos application for Windows Phone is the WP7 edition of our successful innovative application that was developed for the Windows Mobile platform. Did you ever imagine of capturing your own 3D photos with your Windows Phone? Increase your origins of thought with the My3DPhotos App. With only 3 finger taps on your Windows phone, you can easily capture your own high-quality 3D photos, everywhere you are, on-the-go, and share them immediately with your friends on Facebook. • the gray 3D anaglyph method. You may create a 3D photo picking one of them each time you shoot a pair of photos, or choose all of them in order to create 3 different 3D photos (check the manual for details and examples on the methods). The navigation in the 3D library is 3D enabled, so you are able to explore the photo – sets with a real amazing 3D panorama, if you have your glasses with you. Otherwise you may use the 2D skin. The application supports 5 languages: English, French, German, Italian and Spanish. There is also a small manual inside the app for 3D beginners (in 5 languages), in order to capture with 100% quality.